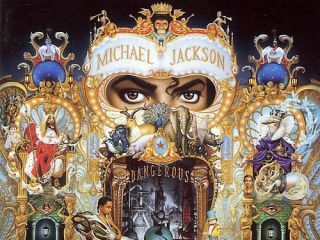 Released in 1991, Dangerous was the follow-up to 1987's Bad. Much has been written about Michael Jackson over the past week - possibly too much - but one of the few things we know for certain about this most mysterious and controversial of characters is that he leaves us with an amazing body of work. Dangerous, his 1991 album, may not have been his biggest release, but it's still managed to shift more units than most artists manage in their entire careers. In an interview conducted last year, super-producer Teddy Riley spoke about his work with Jackson on Dangerous, providing some revealing insight into how the King Of Pop operated when he was in the studio. "I got the call to produce some tracks on Michael Jackson's Dangerous around 1991," Riley begins, as if recalling a matter of fact phone conversation with a telesales marketer - it's not like it happens every day! "No, it sure doesn't," confesses Riley, reflecting on the shear magnitude of the topic. But being a Michael Jackson record, Dangerous was always going to sell, right? So, where's the pressure? "There was more pressure," he says. "I didn't want to be the one to fail Michael. And I'm so grateful it didn't. It thankfully went on to become a success, selling about 34 million records, I think [it's actually around 32 million]." Teddy isn't quick to compare Dangerous to the rest of Jackson's mammoth cannon of world-changing work, but will admit that it was what he considers to be his 'last great record': "It's not a comparison to Thriller," says Riley. "Thriller is a massive album, Bad is a big album, but Dangerous sits in the middle." The Jackson camp wanted a producer who had his ear to the street. It wasn't like the new wonder of MTV could be exploited again as with Thriller. What Jackson needed was a 'hot' sound, and a producer who understood what the icon needed to avoid becoming irrelevant in the wake of the scores of young, black and urban artists stepping up to fill Jackson's sequined glove. "For Dangerous, I brought RnB back to Michael in its barest form; RnB and Funk," says Riley. "We recorded it in California, at Record One, and then we ended up in Larrabee Studios. I was using a lot of vintage stuff to get the sound we needed. Reeds and SSL XLs were mainly the boards we used - I always loved vintage better than digital. It's way better… much warmer." Scan the credits on Dangerous and you'll see that Jackson gets a lot of co-production dues: "On every album Michael does, he has some sort of input," says Riley, "so I didn't mind him getting a co-production." Well, you can't exactly tell the King Of Pop he can't, can you? "Jam was a track that Michael had the idea for. He told me to see what I could do with it so I took it and created some more instruments and reproduced the record - and he loved it. "That's the way it worked a lot of the time. He'd come in with an idea and I'd flesh it out in the studio. He bought it to me as a DAT, and he told me there were things he wanted done, and I did them. It was my idea to get the rapper Heavy D to perform on there as well. He was Michael's favourite rapper at the time." "The element I'm most proud of in this song is my guitar playing. I thought he [Jackson] was going to get another person to play on it but he wanted my good self playing! That was something special to me. I was using an acoustic Ovation guitar. "The whole song didn't take long to produce, actually. I think the longest part was writing everything and getting everything formatted. There's no studio trickery either, really. When you're doing analogue it's pretty much, you know, getting everything on tape, you know? It's very warm. That's basically it." "Now, In the Closet was something Michael came up with, and it came out exactly as he wanted the track to be. He kind of put his vocals on a Dictaphone when he was in another room. He'd often record the vocals on a Dictaphone and take them into the studio and then see how it would all work out. "This is some of Michael's more explicit material on there, in terms of lyrical content [laughs]! But it didn't surprise you at the time. No, not at all." "My biggest memory from that recording was that we used all car sounds as drum sounds and it came out perfectly. I didn't go out into the field and record actual car sounds and take back to the studio - I had a sample CD that was really cool. It wasn't something I'd done before; it was the first time I went for unusual sounds in the place of drums." "One of the biggest things Michael really surprised me with on the Dangerous album was his vocal deliverance on Remember The Time. That really blew me away. I came to the project with this track. That was the sound I was thinking of for this album. Basically it was the sound I wanted on Dangerous and he loved it - loved it from the beginning. I'd describe that sound as, really, like the New Jack Swing sound. "The elements on this song that give it that New Jack Swing sound are the ones that I used when I recorded with Guy and Bobby Brown to pioneer it. Sort of like the twisted samples I brought in. There were no samples of other people on that; what I did was make the sounds myself - I was sampling myself. I'd just jam with a riff and think, 'That's a cool bit there…' Yeah, it kinda really brought a lot to the production side. It worked." "This was mostly from a sample CD that I just put together myself, and it kind of reminded me of the James Brown sound. I could feel it. I thought I'd bring a shadow of some of the greatness of the James Brown production sound to this. I made the sample CD myself - that was me playing instruments, then looping them up and having them lying around for potential projects. Back then I just had them lying around and I hadn't used them… But I really wanted to use them! "Throughout the album I was drawing off a lot of CDs I had hanging around, all played by myself. I'm a multi-instrumentalist." "This has strong global issues - it was a big song. I didn't produce it though, all I did to that song was complement it. Heal The World had a lot more instrumentation on it before I got to it. I thought it needed different things that would really appeal. I did quite a lot of the percussion on there. I did that on there to bring something extra to the mix." "Again I didn't produce this. But again, I added the percussion to the track. I used wood percussion - cow bells, shakers and things like that. Producer Bill Bottrell had an EIII drum machine playing loops. I sat with the track for a while then I said, 'OK, this is a good track. But what it needs is instrumentation'. It had the guitars and Slash from Guns N' Roses on there but I felt if it was going to play live and acoustical, then we'd need to add some acoustical percussion. It was the case that I'd find the tracks very studio sounding and I wanted to add the live funk to them." "This reminds me so much of Dirty Diana. I think he recaptured that sound on this song. You know, I think he went back to his roots of recording with this song to record an incredible track. I thought it would take someone like Quincy Jones [who produced Dirty Diana] to really put an incredible track like that together. I thought it would take someone like Quincy to get that sound, but Michael came up with it. "It was really difficult for me having to follow in Quincy Jones' footsteps. He left big footsteps! He did hear this album and he really gave me a great compliment on my production. He heard it before it was released and he said this was a masterpiece, and that it's ready to come out. "Michael was taking so long and he brought Quincy in to hear it - he was like a quality controller for Michael. If Michael had the chance he'd keep working on songs forever." "Bill Bottrell put in some great production on this track. Because he had his hand in there it ended up sounding perfect. He had the magic touch and had everything levelled up nicely. He's been doing it for so long. He's the best with microphones, and knowing where to sit the instruments on the track. He's really good. "I also like Bruce Swedien who mixed some tracks on this album. I'd never worked with Brucey before that. But I always ask for him as an engineer after working with him on this." "This is Michael again. Bringing a vocal choir in on the track was a stroke of genius. It's something I'd consider doing since hearing him do it. It's a long song as well, a lot of this album really clocks in. This nearly hits eight minutes, I think - it's not a punchy radio edit! Yes, it's long but it came across really well for the album. A lot of the songs on the album are long. That's what makes the album I think." "I really admire the work that went into this track. Anything Michael does, I can admire. It doesn't really remind you of any of his other songs; this one's a bit different to his usual tracks but it stands out. Michael's always innovative. With this track, I just think he went another way due to the structure of the track and the instruments used. Well, that and him working with Glen Ballard with the writing on it - they kind of went head-on with that track." "Another innovative track. I think he was trying to reinvent himself and become more credible; more commercial and he achieves that here. It reminds me of a more worldly version of She's Out Of My Life. With this album he's hinting at his past songs as well as trying to reinvent himself." "Dangerous was about a woman who was just so beyond, you know, beyond the best girl he's ever been with. That was the name of the album, so we thought about doing a song called Dangerous, and Michael came up with the hook. So I said, 'Let me get into the music'. I went to my lab and put the track together. "The track evolved: Michael came in with the hook, I did the music and then we finalised the song. We used a drum machine, the Akai MPC-60, and a lot of the sounds from that and samples I had on my sample CDs. There's no science to it, I just feel my way through the production. I always feel my way - I never do anything the same." "We talked regularly before I produced the album and he described everything he was looking for, sound-wise. He pulled out one of my songs from the Guy album, which I sing, and he said he wanted that sound. He wanted something driving like that. "He always pushed me to be different and innovative and strong. He was demanding and we'd work on songs for a long time; we always had to get the mix right. We had the elements, but we had to get the mix right. "With the sessions, he'd spend a long time doing vocals and sometimes he'd do it on his own. I didn't even have to be there at every session, because he likes to do stuff on his own. He was an inspiration to work with. I kinda learned his way of working and stuck with that formula - so he changed the way I worked on production with artists. "Since the Dangerous project I've learned to get the writing done before I even approach a song on tape. The writing must be right, you know? Perfect. Before you even start. "It's difficult to pick out the strongest elements on the album. Is it my music or his lyrics? In the end, I'd say it's both. There was nothing weaker than the other. That's why it was such a perfect album and such a big seller."